Full of sunshine and with some truly unique clashes of different types of scenery, with wonderful beaches alongside lush, green mountain peaks and stunning blue-turqoise sea is NZ's Bay of Plenty. Boasting a more “tropical” holiday atmosphere than many other parts of New Zealand, the Bay of Plenty certainly lives up to its name of having “plenty” to see and do, regardless of if your purpose is to kick back and relax or get out and explore. The Bay's waters are a key focus of what makes it such a popular destination to visit, and lead to a cavalcade of opportunities for participating in various aquatic activities. Food and produce also play a large part in the Bay of Plenty's offerings, with goods from both the verdant land and the life-filled sea famed for their freshness and quality. 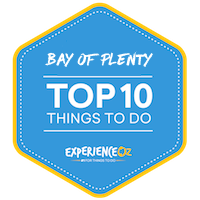 If you're planning to visit this highly enjoyable getaway region on the NZ North Island's east coast that brings with it a number of unique seaside and volcanic marvels, here's our detailed breakdown of the top 10 things to do in the Bay of Plenty. Mount Maunganui features in numerous ways throughout this list, however the most obvious way to enjoy it is perhaps the simplest and best – making the trek up to its peak. This historic reserve that's traditionally owned by Maori offers the best views available in the region outside of dropping hundreds of dollars on a helicopter tour, and can be completed in just under an hour for a cost of approximately zero dollars. Paths up the mountain are well-kept and signed, with the surface covered by gushed gravel providing sufficient grip even though there is no flat ground on the track. Views all the way up the track are generally spectacular, and once reaching the top you'll be presented with a wonderful panorama that extends out to the Coromandel towards the north, out to the Kaimai Ranges and across the city & beyond, with ships making their way in and our of the harbour. The sight of sheep and rabbits on and around the mountain is common as they leisurely graze and hop respectively, while plant-wise there are plenty of the region's characteristic Pohutukawa trees and bottle brushes with their red blooms dotting the mountainside that further add to the charm. Sunset is a special time of day for coordinating your time to trek up Maunganui, with the reflection on the Bay's waters making for a truly magical and photo-worthy opportunity. There's also a number of benches and viewpoints throughout the course of the tracks that provide the chance for a rest and to take in the scenery along the way. Sunset is a special time of day for coordinating your time to trek up Maunganui, with the reflection on the Bay's waters making for a truly magical and photo-worthy opportunity, so if you can time your journey to the summit accordingly you'll find yourself in sightseeing heaven. Perhaps the only downside to the hike is that the area is highly exposed – you'll want to ensure you set out on a sunny day (generally not a problem in the Bay of Plenty) as any wind or rain can quickly turn the experience sour. Be sure to wear appropriately grippy hiking shoes, and choosing between the steeper steps or longer path will be the only real choice you'll have to make before heading out on the journey. There's a reason why locals swear by the Mount Maunganui track; there are few places in NZ that so beautifully combine a range of scenic views all from the one spot for the best possible price – free – and its due to this that it comes in as our #1 must-do in the Bay of Plenty. One of the major - and most spectacular - drawcards to people visiting the entire Bay of Plenty region as a whole, White Island is the name given to an active marine volcanic peak that sits just 48km off the coast of the mainland and regularly emits clouds of gas, making for an impressive spectacle that contrasts beautifully with the vivid colours of the waters around it. The island is accessible by both boat and helicopter, with each kind of tour offering a different perspective on its crater. On the surface, it's a truly prehistoric-looking landscape, with its continually active status leading to an impressive cavalcade of spectacles happening at all times – roaring steam vents and an ash-soaked ground combine to create an eerie, moon-like environment that has to be seen to be truly appreciated. Unlike many other accessible volcanoes around the world, White Island allows you to traverse the innards of its main crater without much physical effort or strain, and its this accessibility that makes it a favourite day trip destination from nearby Whakatane on the shore. On the surface, it's a truly prehistoric-looking landscape, with its continually active status leading to an impressive cavalcade of spectacles happening at all times. Passing through the centre of the crater you'll see steaming rocks intermingled with fluorescent yellow deposits of sulphur that emit fumes that can be hazardous when at their peak – on a tour you'll be provided with gas masks to help prevent any excessive inhalation. Unless the gas flares up, it's easy to forget that you're in what could be a truly dangerous destination, however the volcano is continually monitored by local authorities and tours won't set out if there is prior notice of any risk of eruption. The trip over to the island is impressive as well – by boat as the wildlife of the water make for some decent sightseeing opportunities; dolphins are a common fixture here and will often approach the boat out of their own curiosity. From the air, join operator Volcanic Air and you'll get to see rolling farmland, white sandy beaches and the other offshore islands before absorbing the smell of volcanic gases while gazing down into the crater and its various sulphur vents from high above. Acclaimed by many as New Zealand's best and safest beach, Ohope Beach stretches for an impressive 11km length and offers great views from its shoreline out to the spectacular sight of White Island in the distance. Located near the major settlement of Whakatane on the eastern side of the Bay of Plenty, Ohope Beach sits near the small township of Ohope which has a population of just under 3000 residents and is a favourite marine venue for families due to its safe nature, lovely waters, and regular lifeguard patrols. Waves at the beach are solid and consistent if not spectacular, and the sand is consistently clean and soft due to strict regulations in place that restrict both fires and parties. The length of Ohope Beach makes it seem like it stretches on forever, with the eastern end of the beach and a bit of a walk required if you're wanting to escape from the majority of the crowds who are enjoying the facilities on the nearby waterfront. The local varieties of tree life along the beach also serve the purpose of natural shade on top of simply looking pretty and adding to the tropical atmosphere, and the shoreline and both the beach and bushy areas are rich in bird life, with many sea birds using them as places to both rest and nest. Various species that can be seen around Ohope include terns, gulls, swifts and gannets, to name just a few, and bird watchers will simply need to take a walk along the shore or head through the reserve to see them at rest and play. In the water meanwhile, marine mammals of all kinds can be seen at different times throughout the year, with New Zealand fur seals, pilot whales, dolphins and orcas all featuring at various stages. On the shore, visitors to Ohope Beach can take advantage of the many great cafes, restaurants, surf club and even art gallery that sit within Ohope Village proper, while a children's playground is available for those wanting to keep the little ones entertained. Quality accommodation is available right near the beach courtesy of Ohope Beach Holiday Park meanwhile, and offers a great family-oriented stay while granting excellent access and views of the beachfront proper. Ohope Beach should be on the list for anyone who loves the beach or is looking for the ideal environment to relax and soak up some sunshine while in the Bay of Plenty region. With all the water both inland and out to sea, it only makes sense that one of the best ways to explore the more intimate natural locales in the Bay of Plenty is by hopping in a canoe of kayak and paddling to some of the best local secrets. Both fresh water lakes and the sea itself are great destinations for a paddle, and the local waterway of McLaren lake is home to one of the Bay's lesser-known true natural gems: a stunning glow worm cave that is only accessible from the water. This magical little spot is tucked away amongst the lake's flat, glassy waters and requires only around a 30 minute paddle from the shoreline before reaching its entrance, and local operator Waimarino Kayak Tours can take you on a guided adventure to this enchanting location as well as numerous other local highlights. The trip across the lake is pleasant on its own, with a peaceful atmosphere and lovely forest along the way, however upon arriving at the canyon, you'll be greeted by the spectacular sight of thousands of glow worms glimmering their natural light among the midst of plants and ferns, like miniature galaxies suspended in the dark air! The experienced guides will provide you with some detailed background on the glow worms as well as the local area in general, which only serves to further enhance the adventure. Looking out towards the coast and sea kayaking is another aquatic essential while in the region, and a journey out here will allow you to get up close with some of the Bay of Plenty's many kinds of wildlife. One of the most popular courses takes you around Mount Maunganui at the end of the Bay's peninsula – the extinct volcano is great to view from the ocean as the calm water allows you to see both the harbour and the mount from a whole new angle. Maunganui has a range of rocky outcroppings just off its shore that serve as a favourite sunbathing ground to local seals to soak up their warmth, and the nearby islands of Moturiki (connected to the mainland) and Motuotau (which contains a range of interesting sights including rock formations, caves and even penguins) provide yet more adventures. If you're willing to put in a bit of physical effort, then kayaking and canoeing can provide you with an intimate look at the Bay of Plenty that taking a boat cruise simply can't match. Surfing has long been one of the favourite pastimes of residents of the Bay of Plenty, with numerous beaches and some quality breaks to be found just offshore. The main focal point of the region's surfing community is the tourist hub at the base of Mount Maunganui, which takes roughly 15 drive to reach from Tauranga and features a wonderful left-hand surf break alongside a pristine white sandy surf beach. As the region's surfing capital, Maunganui serves as home to the annual North Regional Surf Championships, with the best and brightest surfers coming to take advantage of the typically reliable conditions and strut their stuff. While this ocean beach provides the big surf, there are also times where rips flare up and it can become quite dangerous, so first-timers will want to stick to the harbour beach at Pilot Bay just a short distance away. This offers guests the chance to zip through this ancient forested area at high speeds with a series of interconnected platforms that provides not only a dose of fun but great views of the surrounding rainforest. There are a variety of surf schools that operate in the area run by friendly locals who aim to provide you with the skills and tools necessary to take your first step into the world of surfing. These are typically completely pressure-free group environments that focus more on providing the basics within a fun, safe and relaxed atmosphere rather than demand anything too drastic of you out of the gate. Within the scenic surrounds of the Mount Maunganui area, it's a great way to learn everything you'll ever need to know about beach safety and how to best handle your own surf equipment. Smaller group sizes are the name of the game to keeping many of the Bay of Plenty's surf lessons enjoyable – you'll rarely come across anything larger than a 4:1 student to instructor ratio – and ensure you'll get the personal attention and tuition needed to not only enjoy yourself but gain the confidence necessary to have fun both in and on the beautiful water. Kids as young as 8 years old are welcome to join in, and with a couple of schools to choose from including Mount Maunganui Surf Academy and Hibiscus Surf School - which both come highly recommended - you'll be able to choose a lesson that best suits your tastes. If you're wanting to experience the Bay of Plenty like a local, then a surf on its waters is a must-do. The waters of the Bay of Plenty have a famously pretty blue-turquoise colour and are full of various kinds of marine life, and with a number of impressive geographical formations and nearby islands – all of which take on an entirely different life when viewed from the sea. Cruises are thus a great way to get a fresh vantage point on the coast line and the Mercury Islands (as well as stunning White Island), and the sheltered waters of the Bay of Plenty typically offer calm sea conditions and make taking a cruise a relatively pain-free experience. Situated in an ideal location in a crook between the Coromandel Peninsula and East Cape, the waters of the Bay of Plenty are a haven for whales, dolphins and numerous species of fish that can make for great sightseeing opportunities while out on the ocean, with local colonies of Gannets rounding out the spectacle. Situated in an ideal location in a crook between the Coromandel Peninsula and East Cape, the waters of the Bay of Plenty are a haven for whales, dolphins and numerous species of fish that can make for great sightseeing opportunities. The islands which populate the Bay also each add their own charming dash of colour to the endless blue: Mayor Island is home to a marine reserve with some decent diving; Motiti Island is dotted with various bays and beaches and also attractions Baleen whales; and of course, White Island (listed in further detail below) is one of the region's most significant natural attractions. Various cruise itineraries put on by different companies who offer a range of vessel types – leisurely sailing yachts and purpose-built dolphin-seeking boats among them – offer everything from wildlife viewing adventures to shorter harbour cruises to day sails with beach picnics, so which cruise you'll most enjoy is entirely up to you. Options for cruising the bay include Kewpie Cruises, who offering a cruise aboard a historic, split-level vessel that offers an overview of both Tauranga Harbour as well as its surrounding islands. Alternatively, travel with Bay Explorer who offer a range of charters and cruises providing 360 degree outdoor views from the largest open-air wildlife viewing sun deck. Extended overnight expeditions are also available should you wish to prolong the adventure and get a more thorough sightseeing experience, which provide a balance between coastal island sailing and a focus on interacting with all manner of marine animals such as dolphins and seals. The majority of cruises depart from Tauranga, so all you'll need to do is choose an itinerary that best suits your desires (and your wallet) and you'll be soon setting off on an epic Bay of Plenty oceanic adventure. Tauranga's nearby forest reserve makes for a great destination for nature-lovers that's got plenty of walking tracks to explore and take in the greenery, however the reserve's undoubted highlight is the tumbling Kaiate Falls which are well within reach from the city itself. All it takes is a short walk from the reserve carpark (which can be reached after roughly a 20 minute drive from Tauranga city and comes complete with toilets and some well-kept picnic tables) and you'll soon be at the first of three main tiers of the falls, with the upper of the three often being labeled the most beautiful while the lower are the largest. The walk to the falls itself is scenic and ripe with greenery, and there are various pools along the way that are popular with locals and visitors alike for taking a dip during the warmer months. It's a common sight to see local kids jumping from the rocks into the main pool, which can seem dangerous to observers but is generally safe as the waters of the pool are quite deep. Upon reaching the main fall, however, you'll likely agree that the walk is well worth the effort – the falls are incredibly picturesque and cascade roughly 15 metres into the maw of the awaiting pool below. The walk to Kaiate Falls isn't too long, however it can be quite steep in places, so at least a moderate level of fitness – or a willingness to take your time and pause for a while every now and then – are advised if you're making the trek. Upon reaching the main fall, however, you'll likely agree that it's well worth the effort – the falls are incredibly picturesque and cascade roughly 15 metres into the maw of the awaiting pool below. You'll want to bring your camera along for the ride, as while mobile phones are all well and good for the occasional happy-snap or selfie, the falls can only really be properly captured by a device with a decent lens. There are numerous spots along the way that are ideal to stop for a picnic, so feel free to make an event of it and take some food and a blanket. Bear in mind that you'll also have to be prepared for the return climb on the way back; while the tracks are well-maintained, they are quite steep in places , and there are a number of steps to navigate when returning. All up, it's around a 40 minute return walk on average if you aren't stopping along the way, and with so many visual rewards on offer extremely close to the Bay of Plenty's largest city, you'd be mad to travel here and not pay a visit to Kaiate Falls. Those in the Bay of Plenty region who are looking for a bit of a rush and with a physical challenge should look no further than the Bay of Plenty's branch of the popular Adrenalin Forest – a fun-filled high wire/rope, zip line and flying fox attraction that lies in a beautiful natural forest setting. The park sits around a half hour drive out of Tauranga and which features different courses of varying difficulty levels that allow you to make your way around the treetops at your own pace. A great level of physical fitness isn't a requirement as if you're feeling too taxed you can simply stick to the easiest of the six available courses – generally speaking, in terms of challenge at Adrenalin Forest, the higher you go, the harder it gets, so you'll be able to garner a satisfying sense of personal achievement. At Adrenalin Forest, the higher you go, the harder it gets, so you'll be able to garner a satisfying sense of personal achievement. There are over 100 individual challenges for people to participate in in total, and all ages from 10 years and up are welcome to test their balance and agility here. The forest-based setting of the park is one of the key factors that adds to the experience; the surroundings of the tall pine trees and the distance from any built up development adds a peaceful atmosphere to what is otherwise more of a adrenaline-based experience. Those concerned about safety can likewise rest easy, as all climbers wear a safety harness connected to a failsafe safety system and the guides are sure to provide an in-depth briefing outlining the best ways to move, climb and secure you throughout the experience. If you've ever wanted to do your best Tarzan impression all within some enjoyable NZ surrounds, Adrenalin Forest makes for a refreshing break for the typical look-and-take-photos sightseeing rigmarole. The Bay of Plenty is nothing if not a foodie's dream, and this is perhaps best exemplified by Tauranga – the region's largest city. Tauranga's location offers a comfortably warm, dry climate that both makes it a pleasant place to visit and is conducive to land that's great for growing a variety of fresh produce, which then makes its way to the city for those visiting to enjoy in various forms. As a result, there is a huge array of quality restaurants and other fooderies to delight your tastebuds in Tauranga, with the majority located within its recently-redeveloped “The Strand” precinct along the waterfront. The site of numerous cafes, pubs, and finer dining options all in a very pleasant spot makes this part of Tauranga a must-visit for anyone looking to indulge their tastebuds. The surrounding region also provides the chance to venture out and sample some delectable wines and some of the area's top wineries are easily reachable, with various tour companies ready and willing to take you to the likes of the Mills Reef Winery, Hillsdene Wine Cellars or the Volcanic Hills Wine Company (drink freely while avoiding having to drive - win) which feature some beautifully landscaped surrounds well within easy reach of the Tauranga CBD. If you're after the ultimate, birds-eye view of the region from high above, make sure your itinerary has a spot reserved for ballooning. While many of the grapes used in the production of Tauranga's wines come from vineyards in the nearby Hawkes Bay and Coromandel regions, the winemakers produce quality reds such as Merlot and Syrah that make paying a visit to any of them well worth the time for the average wine aficionado. The area is also famous for its fruit, particularly its special tangelos (mix between a grapefruit and a tangerine) and that most New Zealand of fruits – the kiwifruit. Lastly, as one might expect from its coastal location, fresh seafood plays a large role in many of the best dining experiences the city has to offer – so much so that Tauranga hosts a regular Seafood Festival that combines the opportunity for visitors to dine on the likes of fresh crayfish, oysters, prawns, mussels and more accompanied by live entertainment. Cap it all off with a drop of one of the fine wines mentioned above and you've got a culinary delight that shows off Tauranga's dining culture with pride. The family-friendly hotspot of the Waimarino Adventure Park is located on the banks of the Wairoa River and makes for a great day out for those with kids in tow. This is a popular local New Zealand water theme park located just one hour’s drive from the Bay of Plenty proper. Pack up the car, bring a picnic and get ready for a fun day by the river banks with water sports activities, water slides, recreational kayaking and more available to you here. The park boasts a number of inflatable water slides, water trampolines, climbing walls, tarzan swings, canoes and kayaks, thermal pools, low ropes course, dive boards and even beach volleyball courts. Unlike other commercial water parks, you are welcome to bring along your own food here with picnic tables, chairs, bbq’s and toilet and changing facilities available and there is a café onsite for that must have ice cream or drink. The activities within the adventure park are suited to older children and adults, however, young children under the age of five are not forgotten with play areas for the younger ones. The adventure park is a budget friendly day out for families, couples or even solo travellers who are wanting to cool down in the sun or are looking for an activity for a few hours or the entire day. Day passes to the park include access to all activities for the day and non-swimmers can still enter to enjoy the ambience of the park for a small fee. The park is open all year round with a multitude of activities to suit visitors in both summer and winter. During September to April enjoy the inflatable giant blob, New Zealand’s only kayak slide, kayak hire and more. In the winter, the park remains open to visitors on weekdays only with the kayak slides, dive boards, warm pools and slip n slides still available to use. You may also combine adventure with sightseeing by joining a evening glow worm kayaking tour in Tauranga. As the sun goes down, watch the sunset and enjoy a peaceful kayak towards the glow worm caves to witness these quirky creatures.